A friend told us she couldn’t get her photos off her phone and onto her Acer computer, though the transfer worked fine with her other computers. So we told her about the Bump app, but now there’s something new out there that’s even better. A free app called “Younity,” merges photos, music, and movies from your computers and iPhones onto your own private cloud. (Same thing coming soon to Android.) Forget having to sync stuff; it would all be available online as soon as you put in a password. In our tests, it worked beautifully. We installed it first from GetYounity.com onto our Windows 8 computer. We then added it to our iPod Touch from the Apple app store. As soon as we signed in, boom, our stuff was all there. Tapping on “videos” brought us a video clip (“I feel pretty,” from West Side Story) — and it was even stored on a different computer, where we hadn’t installed Younity. But both computers were on the same wireless network and the app went out looking for them. We also saw links to all our files stored onGoogle Driveand Dropbox. Google Drive, Dropbox and iCloud are all good backup services, but Younity takes the work out of it. You don’t have to remember what’s stored on which service, or how much space you have left, because storage space is unlimited. (Well, for all practical purposes.) 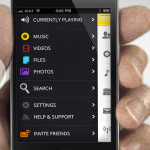 According to Younity’s creator, a typical user has a terabyte of data to store. None of the other services even have a level for that. Okay, we’re impressed.